Earthquake / Eruption summary : During the late afternoon and evening of June 12 2011, a series of moderate earthquakes struck the Afambo, Eritrea area. The moderate earthquakes were followed by 2 strong 5.7 earthquakes. Based on the earthquake pattern and the locations of the epicenter, volcano activity seemed imminent. Our very extensive report is also the work of many of our readers who gave a lot of input. This proves that together, we can beat a lot of information services, especially in developing countries. This is part 2 of the Nabro volcano eruption reporting. Nabro is an Eritrean volcano with NO historic eruption record. . Day 3, 4 and 5 of our reporting describes the buildup of evidence that not Dubbi but Nabro has been erupted via NASA and EUMETSAT satellite pictures. This was only possible with a lot of interaction from our readers. Our video reporter / assembler Robert Speta has made a video based on the content of this article for those who do not like to read. Click here to watch it in our "Quake-TV.org" subsite. To read the full story as it happened, we advise our readers to start at the bottom of the page (earthquake data) and to continue going up. Assab, June 16, 2011- The inhabitants of Afambo, Nebro and Sireru have disclosed that they have been moved to a safer location. Pointing out that there were occasional quakes in their areas, the inhabitants thanked the government for the fast relocation after the eruption, as a result of which there were no casualities. It is to be recalled that the eruption of June 12th around the areas of Afambo, Nebro and Sireru released large quantities of dust and smoke and the quake of 5.7 Richter it caused was felt in our region. This high-resolution, natural-color satellite image shows details of the roiling plume of Eritrea’s Nabro Volcano. The thick plume obscures the site of the eruption, and most of Nabro’s 8-kilometer (5-mile) wide caldera. The bright white color of the plume indicates it contains a large amount of water vapor, with a slight blue tinge that hints at the presence of sulfur dioxide. Measurements from the Infrared Atmospheric Sounding Interferometer (IASI) aboard the European Space Agency’s MetOp-A satellite confirm sulfur dioxide from the plume over Northeast Africa and the Middle East. UPDATE 16/06 - 17:35 UTC : OUT OF SERVICE FOR A COUPLE OF HOURS We are sorry that some of you got empty pages for a couple of hours. Due to a server issue we could not reach you any more :(. It is fixed now and hopefully everything remains as it was before. We know that this page becomes very long, but the main reason for keeping it this way, is that there is a relation in between many updates and images. The page is loading relatively quick here. If you should have problems with it, please let us know. 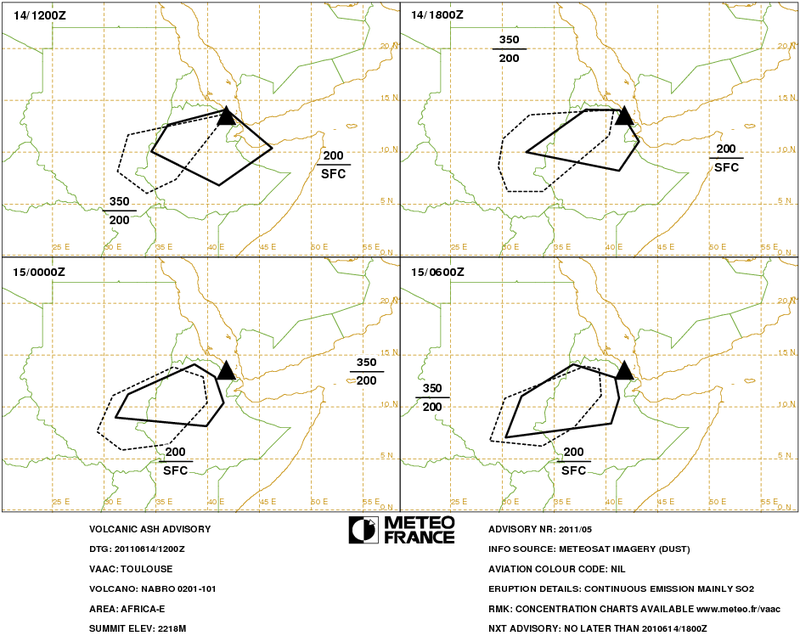 UPDATE 16/06 - 13:40 UTC : The Djibouti based "Observatoire Géophysique Arta" has published far higher Magnitude values than earlier reported by EMSC. The Magnitudes they have listed were : 3.9, 4.4 and 4.5. As their Seismograph stations are very close to the Nabro volcano, we do consider these values as "to be trusted"
UPDATE 16/06 - 13:13 UTC : The picture of the ash cloud proves that the cloud is far more extending to the North West than this morning. The front of the present cloud has almost reached Khartoum in Sudan. Compare this picture with a similar picture we published at 08:35 this morning. Interesting to know is also that the present cloud only contains ash close to the volcano. The extended plume contains mainly SO2 and Ice. UPDATE 16/06 - 10:59 UTC : Below a brand new MODIS image from the Nabro volcano jst released by NASA. UPDATE 16/06 - 07:41 UTC : The activity of the volcano picked up again. The Sat24 infrared animated satellite series is showing a far lengthier ash plume than yesterday. 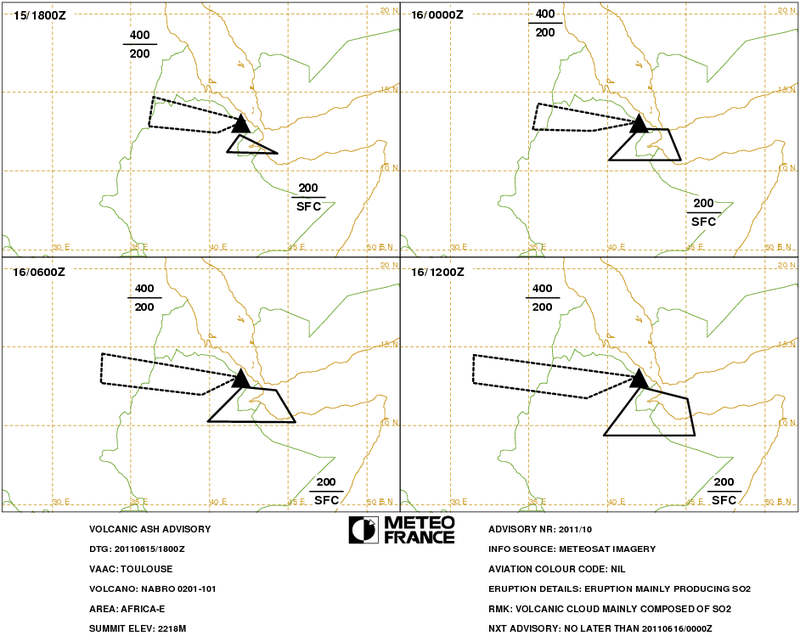 VAAC (Volcano ash advisory) has also increased the area which is contaminated with the ash cloud. 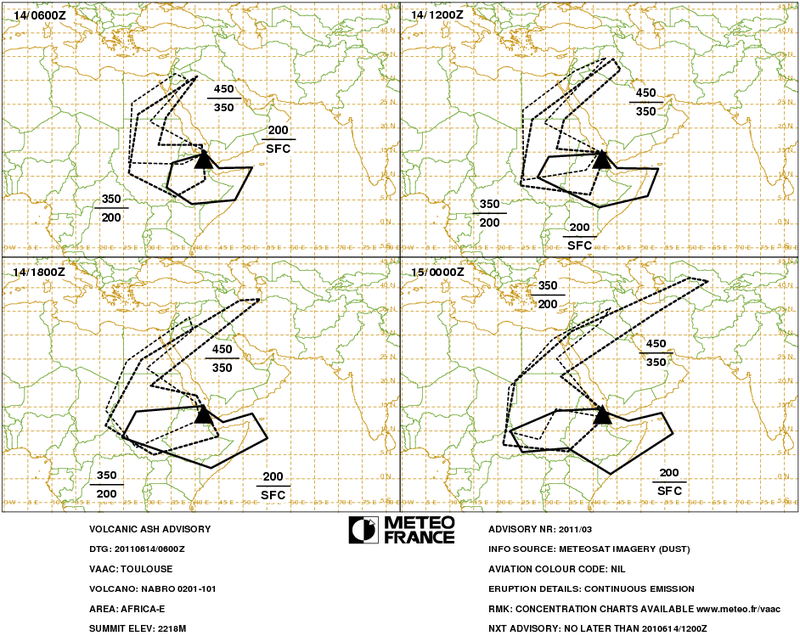 Click here to see the ash maps (06:00 UTC bulletin). UPDATE 15/06 - 21:31 UTC : Below the MODIS - - NASA picture as distributed taken on June 13, 1 day after the explosion - By using the highest definition, we were able to show the violent action much better than in most other sites . The picture is indeed a high resolution picture, but as said in the update below, satellite photography can show us much better details from the caldera. The present state of the eruption is a lot less intensive and might come up with more details. 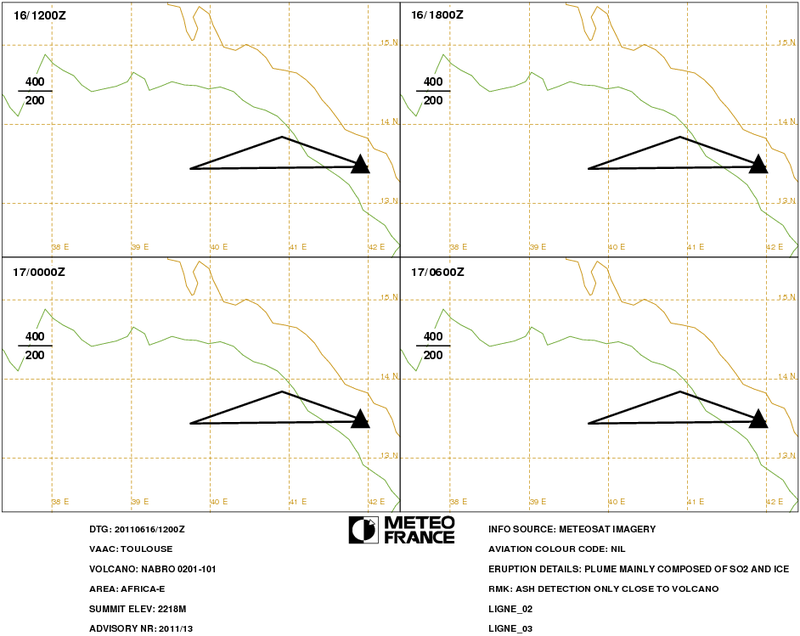 UPDATE 15/06 - 20:28 UTC : When will the HD-satellite images be released from the current eruption ? Why are we making this remark ? We are almost sure that the satellite companies like NASA and EUMETSAT, to name a few, will be able to show us visual and infrared HD-pictures from the crater area. The Cnes SpotImages from Google earth are revealing almost every detail of the crater. If an identical image from the current state of the volcano would be published, it would certainly reveal what really happened. Unfortunately we have no other means of information at the moment. 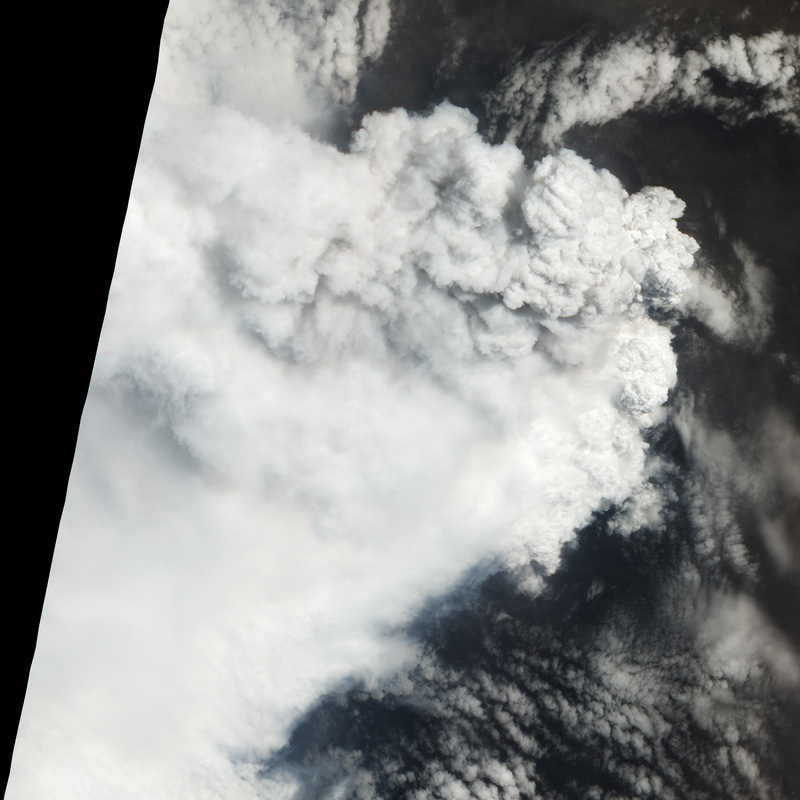 The MODIS picture showing the ash plume on June 13 was of a far too inferior quality. If such HD-images do exist, can they please be published in the open Internet. If they do not exist, we hope that the satellite companies will do their best to make them soon, as they will be invaluable for science. Earthquake-report and their thousands of users will be very grateful to them. The volcanic ash cloud in the Northern part of Ethiopia is clearing. Therefore, Ethiopian flights to Djibouti will resume today June 15, 2011. Flights to Khartoum and some destinations to the Northern part of Ethiopia are still suspended. We request all our passengers to call their nearest Ethiopian offices to coordinate their travel plans using the following contact addresses. 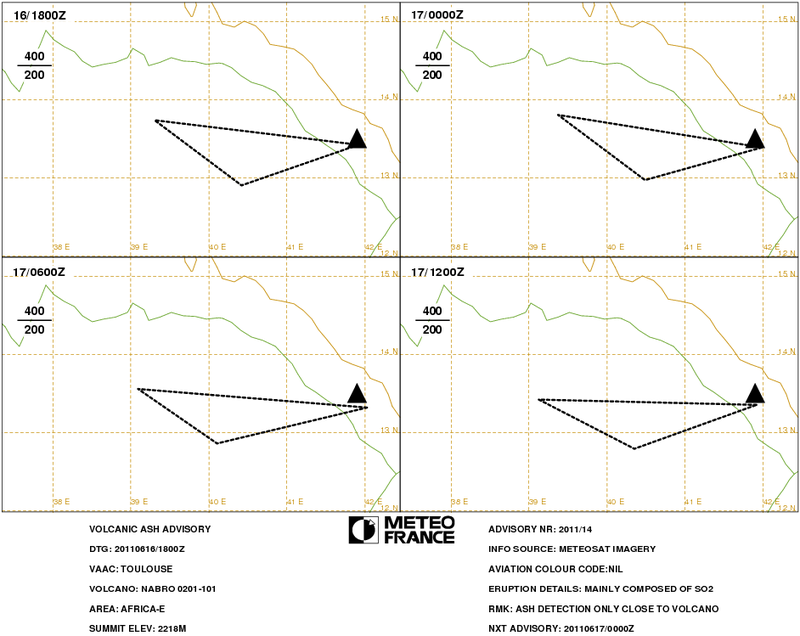 UPDATE 15/06 - 14:21 UTC : The composition of the volcano cloud is containing a lot less ash than in the early hours. 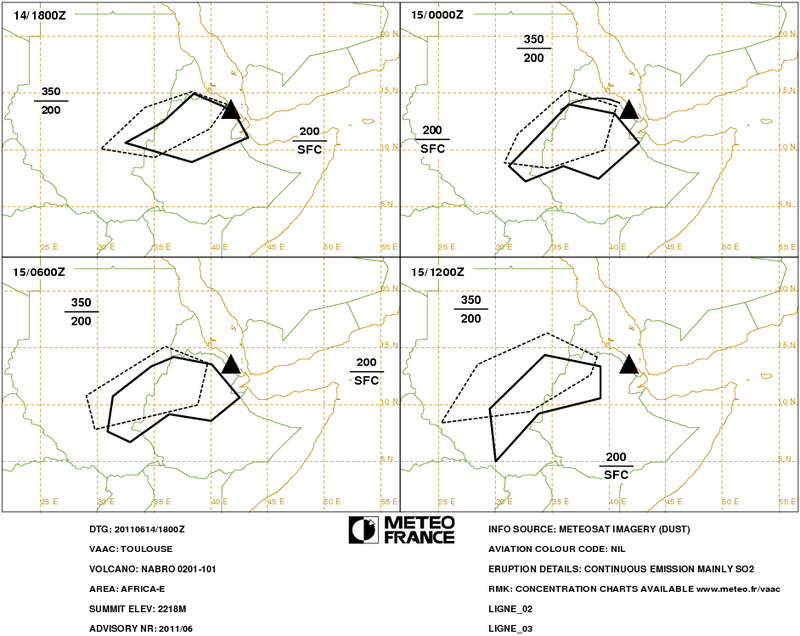 UPDATE 15/06 - 14:11 UTC : Press reports out of Djibouti are confirming our earlier information that the air space above Djibouti was closed on Tuesday. The smoke consists of fine particles of ash. The cloud has forced officials of Ethiopian Airlines to cancel flights to Djibouti, to the north of Ethiopia and to Khartoum, the Sudanese capital on Tuesday. UPDATE 15/06 - 13:57 UTC : On the animated satellite picture one can see a faint ash cloud blowing to the west. 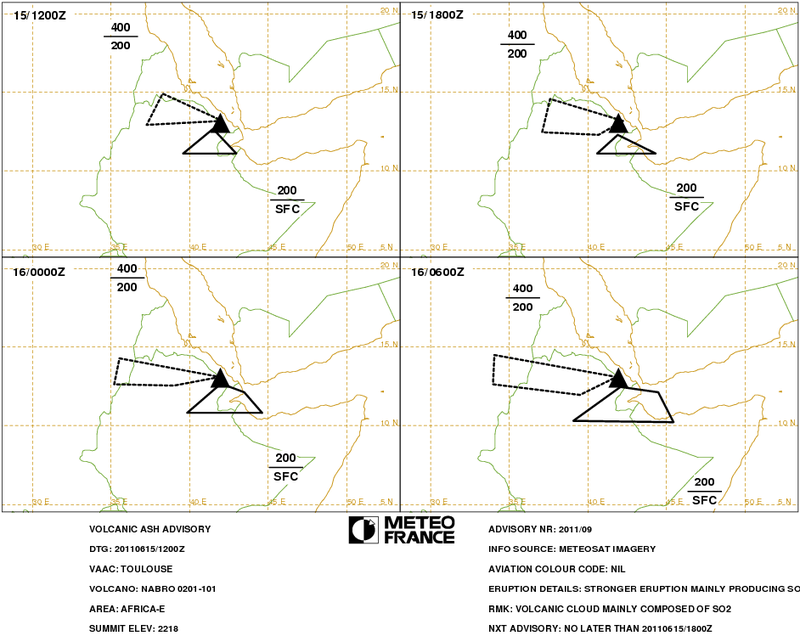 Reading the new VAAC bulletin at 12:00 UTC, we can see that the lower cloud (20,000 feet) will perturb probably all air-traffic to Djibouti. UPDATE 15/06 - 08:28 UTC : We have changed the title into "still NO news from the Nabro area after more than 2 days!" to express our sadness that after more than 2 days nobody in the world can give us a precise picture on what exactly happened at the moment of the explosion / eruption. The bulletin from the Eritrean government only stating some generalities is far from satisfying. We do experience here an eruption of a historic volcano, which should be world news, but we can only assume that the location of the volcano is one of the reasons. UPDATE 15/06 - 07:15 UTC : As we have still NO information from the ground, we continue to work with the satellite weather images and with the Ash advisory bulletins. Based on both, we see a strong decrease in activity. UPDATE 15/06 - 07:10 UTC : Dawid Wolde reports from Djibouti : Stuck in Djibouti with all flights out of Djibouti canceled, we decided to drive to Lac Assal, a salt lake about 125 kms north of Djibouti city and considered to be the lowest point in Africa at 153 meters below sea level. We saw the ash cloud, the sun was completely blocked and we could not see the sea because of the ash. UPDATE 14/06 - 19:50 UTC : Ethiopian Air Lines has canceled today flights to Khartoum, Djibouti and Northern Ethiopia. the Exc. Director told the media that the ash cloud is approaching Addis Ababa in low altitude. The airline is forced to change route directions to Europe and Asia (report from Beni Yebi from Nazareth, Ethiopia). UPDATE 14/06 - 15:44 UTC : May we kindly ask some cooperation from the scientific community here. Sharing the information they have collected in the open Internet would serve everybody in the world. There is a lot more to say about this eruption and similar eruptions in the area. Which volcanologists or geologists have reasonable resolution pictures from the Nabro volcano they want to share with the open Internet. UPDATE 14/06 - 15:34 UTC : Almost 2 days after the explosion of the volcano, we are still without any in-depth news and/or pictures from the eruption of the Nabro volcano. Maybe Mrs Clinton has seen the eruption from the air and could send us some pictures. The eruption did increase a little bit like reported by reader Guigui (see comments). Click here to see the current infrared image. 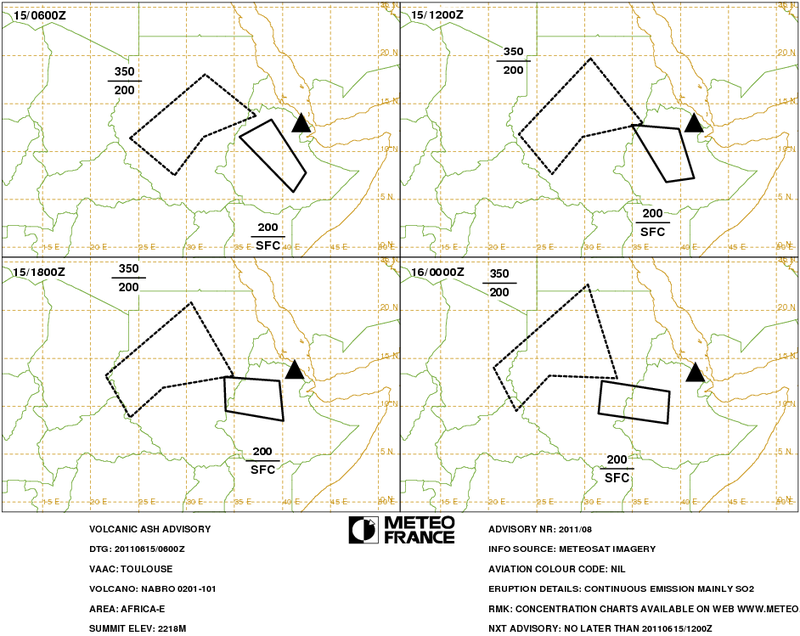 UPDATE 14/06 - 15:24 UTC : Updated Ash advisory update from VAAC Toulouse at 12:00 UTC. Click here to see the latest Ash Advisory bulletin. 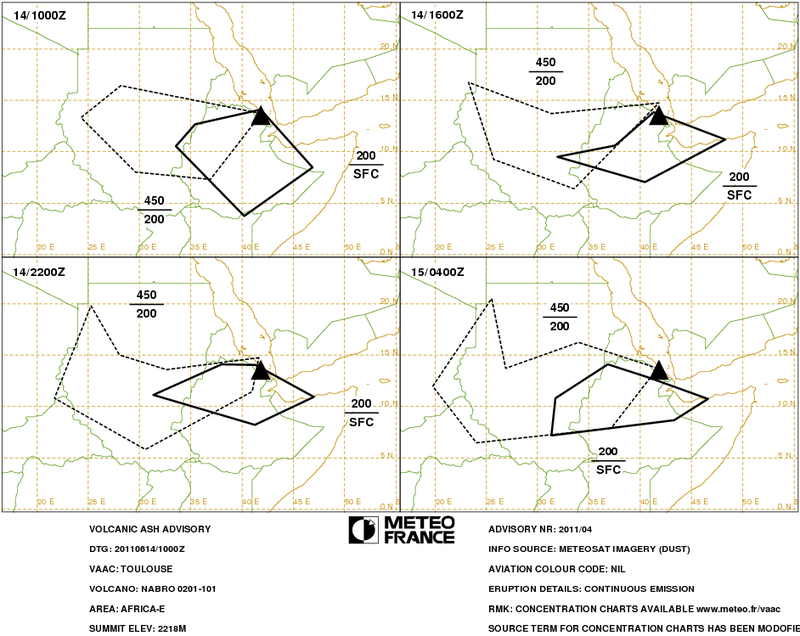 UPDATE 14/06 - 12:01 UTC : New Ash advisory update from VAAC Toulouse at 10:00 UTC. Click here to see the latest Ash Advisory bulletin. 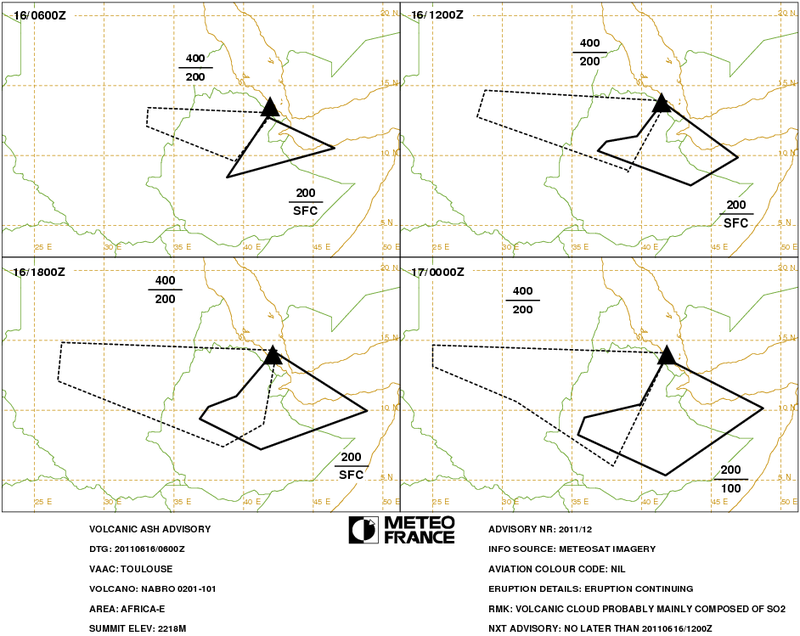 UPDATE 14/06 - 08:03 UTC : New Ash advisory update from VAAC Toulouse. Click here or on the picture below. We can only tell that the ash cloud is extending over the Middle East, later today and tomorrow even in Eurasia. The eruption is following this update still going on at full force (cloud altitude). This update was generated 2 hours ago. During the late afternoon and evening of June 12 2011, a series of moderate earthquake struck at first near Afambo in Eritrea and later 100 km more to the south in Ethiopia. At the moment of writing, we do not know whether these earthquake have a tectonic or a volcanic origin.